About 1,700 jobs are on the line after the sportswear retailer Allsports called in the administrators Tuesday. Many of the chain's 267 stores must close after a harsh price war, administrator BDO Stoy Hayward said. But for the time being, it is business as usual for the clothing chain. "Whilst we are assessing the situation it is our intention to continue trading as normal," said BDO Stoy Hayward partner Dermot Power. The business has long been up for sale and there are at least two likely bidders. One is Allsports founder and chairman David Hughes, who is believed to be interested in acquiring large chunks of the business. Another is rival sportswear chain Sports World, and a third could be JD Sport, also a rival. 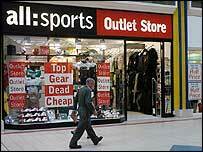 Analysts say Allsports failed since it only stocks clothes. To compete, it would have benefited from also stocking sports equipment, they say. Allsports owes money to a range of creditors, including Mr Hughes who has agreed to buy £10m of the company's debts from Barclays Bank. In addition, it owes Charlton Athletic, the Premiership football team, money. This debt is said to relate to unpaid sponsorship fees.